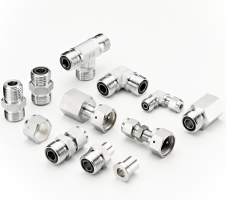 DK-LOK® DO fittings are designed for quick assembly in pipe, tube, and welded systems. This design allows for simple installation in tight spaces. Axial clearance is not required for disassembly. The method of sealing is achieved by a captive O-ring in the body of the connection against a flat metal face. DO assemblies can perform in high pressure to critical vacuum with a wide range of temperatures. Optional O-ring material availability increases the range of applications for DO fittings as well.